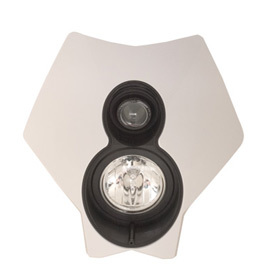 The Trail Tech X2 Dual Sport Motorcycle Headlight features a bright halogen lamp. It has an adjustable clipped beam, keeping the light on the road. This allows the Trail Tech Dual Sport X2 Headlight to meet DOT standards for street use. If you're looking for a headlight upgrade, you'll find the Trail Tech X2 Dual Sport provides everything you need. The Dual Sport X2 halogen headlight has a spread and projection that will light up everything you need to see. The headlight meets DOT requirements. It is pre-wired with OEM-style connectors for an easy plug-and-play installation. A model-specific power wire harness 3600-SWHA is included. The headlight's halogen lamp is 70 watts. This headlight is so much brighter than the one from the factory! The low beam puts out more light than the factory on high beam. When the high beam on the X2 is turned on, holy cow does it get bright! Not only does it give far better light down the road, it also gives better light to the side. The instructions were good and well detailed. Follow the instructions carefully and you'll have an easy time installing the light. On my 2011 EXC with an LED taillight the stock stator puts out enough power to run the light even on high beam. You won't be disappointed buying this unit! Solid light for the money. Visability is good. Wiring instructions could be better. Overall I think it will work out just fine. But, it doesn't put out as much light as I would like. That and the low beam light bulb already burnt out. Other than that, it's great. Works well with the tusk dual sport kit. It puts out OK light it's fine for street riding and will get you off the trail after the sun sets. But you will not want to go trail riding at night. I have a couple issues here. One is the screws supplied for hooking on the brake line tube slider bracket are rusting, and they were just barely long enough. Also the head light handle bar switches are junk and broke right away. I ended having to replace the switches with a different brand. I also had to replace the main bulb because it burnt out very quick too and was too dim. After replacing the bulb with a silverstar 50W, it is much brighter, but it was a pain to do the swap! This light went on a Gas Gas 300, but again no listing for it. It works extremely well. RMATV went above and beyond on this one for me. Not only did they price match when I found it less expensive somewhere else, but they shipped it for free and put in the combo kill and light switch from trail tech. Put this on my 2005 crf 450x and it looks great as well as gives off good light at night, better than the stock. It was a bit tricky to figure out the wiring but I figured it out. Wish it would have came with a switch of some sort to go from hi beams to low. I ended up buying a toggle switch from the auto store but had a hard time mounting it. Purchased light to use for Dual Sport rides. Serves for this function very well. Product is of high quality and interfaces with the existing KTM MXC wiring harness seamlessly. Easily installed and came with a quality handlebar switch assembly. Designed for the limited output from the stock charging/battery system. Performs very well at night. I have a 2001 KTM 250 exc would this be easy to install or will I need to sauder and cut wires? Hey thanks a lot man I relay appreciate it!!! I installed on a EXC 450. I did not have to cut or solder wires. Ultimately, it depends on if you already have a headlight installed and the shape of the wiring plug/connector. I unplugged one and plugged in the other. The color is not a perfect match, but it looks good and the difference may be due to the age of my bike. If you want to check your wire plug/connector, I could try to confirm. It will probably require some cutting of wires mainly because your stock headlight plug isn't going to match the trail tech headlight. Also do you have a high/low beam switch? My '04 450 EXC did not have one originally so I purchased the controls for a newer model EXC. You should only have to crimp in a few male/female bullet connectors. This makes it easy to pull the lights and wires completely off and reinstall and connect easily. I have a 2006 KTM 450 EXC. The set up was very easy. The head light wires connect to your existing wires. what is the difference between X2 off road and X2 dual sport? BEST ANSWER: The only difference is that the Dual Sport is model specific and comes with the correct plug to hook right up to the bike it's designed for. I just put one on my KTM 530 EXC. The off-road version comes with a universal wiring system with switches so you can connect it to any bike that has a charging system. I have the dual sport head light on a 520 EXC. The bottom lens has cracked, is the lens replaceable? If so, where can I purchase the lens? BEST ANSWER: We do carry just the top bulb that you can purchase. Does this need other components changed in the motorcycle? BEST ANSWER: This comes with the headlight and mounts along with a few short wires coming from the headlight. You'll need to wire it into your existing light harness to work.